I have to say this was a pretty challenging issue to put together. Not in a bad way though just that 2018 is starting out with so many choices to choose from. 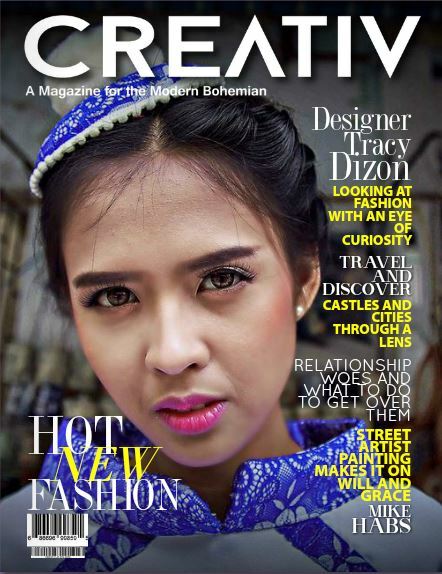 I have to say that the main story is definitely a delight Fashion Designer Tracy Dizon, is from the Philippines and we had the privilege of featuring her work as she just recently won a fashion competition from Brooklyn New York. It is always wonderful featuring artists from all over the world and this one is certainly special. Get to know her story and the reason behind her dream. As the UNIQUE issue we have numerous Fashion designers showcasing their talent today, Richard Petit from Papillon Dezign , who is no stranger to our magazine and Kia T Vonvega, an emerging designer who is more on the risqué side of things. However we are featuring some talented artists such as Mike Habs, a street artist currently residing in Los Angeles California, and Karenina Fabrizzi from Italy. We consider ourselves privileged and fortunate to be able to feature so many talented individuals for the past 3 years. We are now embarking into a new year, with even higher expectations and we can’t wait to see what this year will bring. We also are ever so grateful to continuously have our writers with us, always bringing us the best of their thoughts. We would like to wish all our readers a Happy and Prosperous New Year. Enjoy the 24th issue of CREATIV Magazine .